Metal maniacs, rejoice! 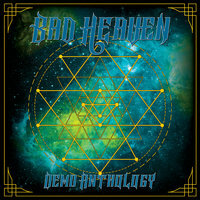 I'm proud to present to you: BAD HEAVEN; signed via TMU Records, hailing from the United States of America - performing Speed Metal, on their first compilation album entitled “Demo Anthology” (released February 21st, 2017). Since formation in 1979; the quintet in question have only 2 Demos behind them, I'm introduced to both of them - compiled into one full-length compilation album. Better late than never, right? Well the quartet split up around 1987, and not a word from them since then - until now. “Demo Anthology” fuses both Demos “Crystal Dagger” (released in 1985) and “Dragon Lord” (released in 1987), resurrecting the tapes by TMU Records and a proper release to boot, you can finally witness a band way ahead of their time. Influenced by the New Wave of British Heavy Metal (NWOBHM) era, the band incorporate up-tempo songs with shredding duel-lead guitars in classic U.S. Metal style. 8 tracks ranging at around 36:46; BAD HEAVEN examine a much more speedier JUDAS PRIEST instrumentation, blended with MERCYFUL FATE vocalization and musicianship. Consisting of Gabino Bustamente on vocals; the frontman composes an incredibly high-pitched formula of 70s Rob Halford esquire screams of steel, with a solid King Diamond balance in one tremendous package. In “Crystal Dagger” this is well-noticed, combined with thunderous galloping harmonies from complex, dexterous duo Edward Reyes & Joey Benz on guitars - the pair efficiently provide a savage tone in their sinister, melodic structure. “Metal On Metal” (not to be confused with the ANVIL classic) develops intricately designed arrangements, featuring unrelenting haste and 100% Metal with a Thrash attitude which has attributions of relentless stimulations. “Demon Slayer” showcases true grit with powerhouse crushers Bobby Rodriguez on drums & Myrna Samperi on bass as they supply a sufficient amount of organic aesthetics into the sound production; as a speed thrasher myself, I certify this substance as enlightening and fulfilling. The songwriting is full of proficiency in the embedded sub-genre, even first time around - I am already pleased with the result so far. “Fear No Evil” contributes similar characteristics; all members perform with a dominant, uncompromising inclination - galloping velocity and equally pummeling distinctions differentiating with grace. Rounding up the “Crystal Dagger” Demo, let's move on to the “Dragon Lord” Demo. “Radical Aggression” does what it says on the tin, furiously intense supremacy flourishes with original and memorable compositions as the frolicking rapidness continues in fierce ascension. The singing adroitness is full of complexity, as it continues to shock my composure - keeping one fully captivated and motivated in a fixated state of headbanging and fist-pumping adeptness. Everything sounds enticingly relishing, as BAD HEAVEN keeps things in true 80s Speed Metal fashion. “Caverns” brings us anarchic, depth and power while distribution hard-hitting riffs that will have you reeling at the sheer excessiveness the band thrive on - despite being recorded as demos, these songs sound elegantly exquisite and it makes me wonder why they split up at such an early stage. “Reigns Of Fate” showcases more swift precision as the band amp up with full force, delicately pushing forward with more unprecedented solos and formidable destruction that surprisingly keeps me in awe. Concluding “Demo Anthology” with “Dragon Lord”, I am overall compelled to say that BAD HEAVEN outdone themselves back in the day with their only 2 releases, and while TMU Records revived the band - who knows what the future has in store for them? If you're into modern Speed Metal such as MUNCIPAL WASTE yet crave that 70s/80s atmosphere, this release will certainly entertain you. For all Speed Thrashers and Metal pounders alike!